NOTE: The following is a partial recapitulation based on information from the ‘914 Journal’, a newsletter detailing the history of the original ‘914’ Film & Video Group distributed in November of 1998 and now the continued history of the Westchester Film Group. 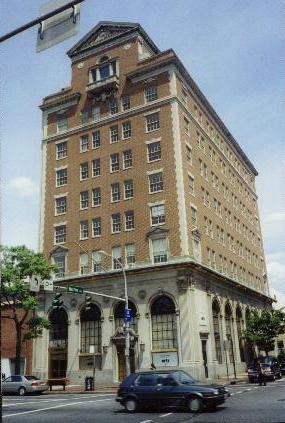 The Westchester Film Group evolved from the ‘914’ Film & Video Group which originated as a Westchester County "Salon", the term used in the Spring of 1997, by the national, not-for-profit arts advocacy organization, The Association of Independent Video and Filmmakers, or simply AIVF - established and headquartered in lower Manhattan since 1974. The Westchester group was one of some eighteen nationally, at that time. The first organizer was Videographer Robert Curtis, who was joined by Filmmaker/Composer, Laura Siddi as co-organizer. The AIVF had only a few years earlier, embarked upon a program of sponsoring "Salons"; their term for groups connected or interested in the various aspects of film, television, multimedia, etc., who wanted to meet with other local, like minded individuals, to network, share ideas and talk shop. With Mercy College secured as a meeting site, AIVF provided a database of subscribers to their monthly magazine ‘The Independent’, in the Hudson Valley area, and announcements were sent out. 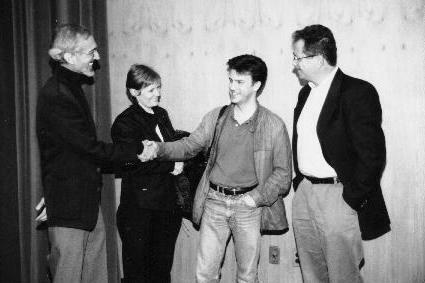 The first informal meet in July 1997 drew approximately nine people. They talked, exchanged numbers, and shared information about their backgrounds, as well as hopes and frustrations of pursuing creative careers outside of New York City & Los Angeles. There were no Robert’s Rules of Order, no Recording Secretaries, no Treasurers, etc. In fact, there was no agenda, per se. What there was, was a feeling among the attendees, that for the first time, they had connected to others like themselves. They agreed to meet again. Thus, with a permanent listing (as "The Westchester Rockland Salon") in the back of the Independent magazine, the right to use AIVF’s name, their mailing list, and finally, a donation from AIVF of $250 to cover our expenses for one year, the Westchester Film & Video Salon, as it was dubbed, was born. Opting for a more central Westchester location, the next several meetings took place, approximately monthly, in the evenings, at The FireWorks Brewery in White Plains, which graciously set aside a private room for us. With small notices in The Gannett Chain’s newspapers, the number of people who attended those early meets fluctuated from a low of four to around fifteeen - but a pattern emerged. Attendees would, after filling in sign-in sheets requesting contact information - round robin, introduce themselves, and tell how they’d come to hear of the group, before usually breaking up into informal one on one conversations. There were numerous suggestions for future meets; possible guest speakers, tours, databases, workshops, advocacy programs, etc; many good ideas, and some not-so-good. Several people attended once, never to be heard of again, others returned repeatedly. Most importantantly, these "gatherings" (we thought "Meeting" too formal) provided a forum for discussion and networking. 1998 Six months later, for the new year of 1998, the fledgling group decided it was time to broaden our approach. Through the efforts of Laura Siddi we were offered, and accepted, what was to be our first "Program"; a tour of Post Resources, an Emmy Award winning AVID editing facility owned & operated by Rob and Jacqueline Weir in Ossining, NY. Hiring their own publicist, the Weir’s were able to get us strategic mentions in various publications throughout the county. We optimistically hoped for a turnout of two dozen people. What we got was wall-to-wall attendees from as far away as Rockland and Putnam. From that point on, we decided on an alternating approach of "Informal Gatherings" and "Formal Programs". The following gathering was a small Februrary turnout on one of the worst nights of the year in Mamaroneck. However, in March we presented, through an invitation from the Media Arts Department of Westchester Community College (aka WCC), a documentary from Nicole Bettencourt, which had previously been aired on HBO, entitled "Before You Go". We charged $3 to cover expenses for a group of about two dozen. April was a real coup. Delayed from a previous date, we skipped the informal gathering, & returned to WCC for the program "Making an Independent Feature Film". Some seventy two people, including many film students, turned out to hear our guests; Dobbs Ferry native, writer/director John Walsh, who’s first feature, Orion’s, "Ed’s Next Move", was shown at Sundance and went on to secure theatrical, and then video release; a rare critical and financial success. He was accompanied by Mary Harron, a writer, and also a first time director (at the time) whose Orion debut feature "I SHOT ANDY WARHOL" was also a financial and widely critical indie success which she translated into some top-notch tv work and the recent feature "AMERICAN PSYCHO". The filmmakers took turns describing their sometimes tortuous paths in making their movies. Both filmmakers showed video clips of their respective films, after which, author and moderator Marhshall Fine, film writer and reviewer for the Westchester Rockland Newspapers, posed questions to them and fielded questions from the audience. What the group walked away with, based on John and Mary’s experiences, was, that even under the most ideal circumstances, deciding to write and direct your own feature - from chasing down investors, securing the right talent and locations, to maneuvering through the tricky legal and marketing obstacles, without a net, is one of the most daunting (and fulfilling) experiences that an individual can ever go through, and definitely not for the faint hearted. For this special event we blitzed every media outlet we could, and again, only charged $3 fee to cover our expenses. We handed out programs to all who attended, and video taped and photographed the proceedings. John and Mary graciously took the time to talk to individuals afterwards. This was by far our largest turnout. Who could have predicted that there’d be that much interest for a program on indie filmmaking on a Wednesday evening in Valhalla, NY! In May we returned to our informal meet. This time it was held at Borders Cafe in Mt. Kisco who donated the space. There were some new faces among the fifteen people attending. Though we’ve never asked people to "RSVP", it was apparent, from this gathering, that we could never predict who or how many will turn out for any event or meet. The large turnouts from Post Resources didn’t translate into numbers for February’s Mamaroneck meet, nor did the April program at WCC translate into numbers at Mt. Kisco. Still, we stuck to our usual round robin format of introductions and everyone seemed to enjoy the evening. In June we toured "Dubs & Sprockets", an AVID editing and recording studio in Mt. Kisco. In one of the worse storms to hit Westchester County, about a dozen people attended that evening, including Iris Stevens, Westchester’s new Film Commissioner, who made a brief appearance and expressed support for the group. July marked our one year anniversary. For what turned out to be a low key event, we returned to FireWorks in White Plains. This time we had nine attendees, but seven of those were new faces. Jonathan Kaplan, who’d been helping with publicity, and co-ordinating events officially became co-head of the group. The group was also renamed as "The ‘914’ Film & Video Group, or simply ‘The 914’ (for the Westchester telephone area code) as a simpler moniker. In August Jonathan took a private group to visit BlueSky/VIFX Productions in Harrison, NY. Though they’ve done the digital special effects on dozens of commercials, as well as features such as The X-Files Movie, Fight Club and TITANIC to name a few, we'll always know them as the company that gave us all those singing, dancing cockaroaches in MTV’s Joe’s Apt. Led by BlueSky’s Public Relations Co-ordinator, Brooks Jewell, we saw the slow, painstaking creation of the aliens in "Alien Resurrection", and were treated to a walk through of the studio, and a talk with animator John Sieciewicz. At tour’s end we were greeted by one of BlueSky’s founder’s, CEO David Brown. We partook of a nice buffett and two videos on "The Making of Joe’s Apt" were raffled off. All this before SUNY grad, Blue Sky’s Chris Wedge won the Academy Award for his animated short "Bunny". Many thanks to Brooks, John and David. We continued our pace with informal meets, including one in October at Bee Harris Productions, a digital editing facility in Mt. Vernon, which brought out a crowd of fifty seven. Before touring the editing facilities, there was a pot pourri of speakers, including Yonkers resident Robert Celestino who talked about his feature film, "Mr. Vincent", shot in and around Westchester. November again featured Gannett News Film writer Marshall Fine, this time interviewing writer/director Terry George. The Pleasantville resident who co-wrote ‘In The Name of the Father’ with Jim Sheridan, and wrote and directed the features ‘Some Mother’s Son’ and ‘A Bright Shining Lie’ for HBO Pictures, regaled the audience of some eighty attendees at Westcheter Community College and took questions from the audience. In response to repeated requests since it’s inception, at the end of the program, Jonathan presented copies of the group’s first newsletter; eight pages of text and photos detailing the group’s history and hopes for it’s future to that point. The newsletter was handed out free to everyone who requested a copy. 1999 Deciding against scheduling a meet during the holiday season, we wouldn’t convene again until after the new year. In many ways, the informal February ‘meet and greet’ at FireWorks Brewery would prove to be our pinnicle and pivotal success. It had been some three months since our previous meet, and on two previous occasions, successfully attended ‘topic’ programs, had seen smaller than expected turn outs at follow up events. In much the same way that our meet at Post Resources a year earlier went above and beyond our expectations, so did an overflow crowd at FireWorks jam our small meeting room, that it extended out into the restaurant itself. The sheer number of people, better than fifty throughout the evening, mitigated against any ‘round robin’ introductions. Attendees were encouraged to introduce themselves, and network and socialize with one another as best they could - which is what we did for the full three hours. There were several new faces and some strategic networking contacts were made, which would later prove to be most fruitful for some of the participants. We had now forgone the grind of scheduling, programming speakers and the publicity involved in staging fourteen straight monthly meets. Our next ‘official’ meet was in May at the Westchester Arts Council, in their new headquarters on Mamaroneck Avenue in downtown White Plains. Arts Council Executive Director Janet Langsam addressed a turn out of about twenty five. This time, in addition to the usual refreshments, name tags, (as cringingly hokey as the idea sounds), were handed out with the attendee’s name and identification; "Actor" "Writer" "Filmmaker" "Student" or whatever designation they chose, to better encourage attendees to network with each other. It seemed to work. July would see the last ‘official’ program of the group in it’s original form. Again, we returned to Jackie and Rob Weir’s Post Resources in Ossining, for a demonstration of the new "BlueICE" processing board with the Avid Media Composer 1000XL editing system which can create intensive special effects and 3D animation. The turn out of about two dozen were treated as they were, a year and a half earlier, with the utmost hospitality by the Weirs. We decided to go on hiatus for the summer, and due to internal differences, Bob and Jonathan would reconvene their own separate sections of the ‘914’ Film Group in the Fall. The remaining recapitulation will concern itself with the latter’s activities of the ‘914’. "The Writers, The Reader, The Reel Deal" was the moniker of our program at the Amercian Red Cross in White Plains in November. The event was intended as a co-event, the first half; informal gathering, the second, scheduled speakers. For over two and a half hours, Westchester WGA (Writers Guild of America) writer/Producer Ed Woodyard ("Mork and Mindy", "thirty something" etc) and writer/director Ethan Wiley ( the cult horror films "House I & II", & "Children of the Corn IV") gave a wonderful free wheeling discussion on the rewards, as well as the harsh realities, of the business side of screenwriting, using their own personal experiences, working on both coasts, to paint a true picture of the motion picture industry today. Again, the guests took the time to answer audience questions in detail. In early 2000 the ‘914’ ended it’s relationship with AIVF which eventually withdrew financial sponsorship of all it’s salons nationwide. Also, our informal meeting place, The FireWorks Brewery, unfortunately is closed. We'd like to thank Maggie for all the times she lent us the use of her eatery. On Wednesday March 3rd, 2000 we had our first “914” meet of the New Year. Rescheduled from an earlier date, this meet found us for the first time at Mercy College’s White Plains satellite branch on Martine Avenue in White Plains. 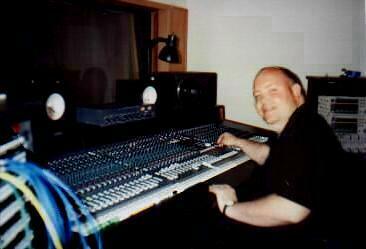 The setting was their underground Music Recording Studio Department headed by director Paul Steinman. Our featured guest for the evening was teacher, composer, recording engineer and musician, Steve Ward and the topic was Film Scoring: Aesthetics and Techniques. Refreshments were served as we met informally for the first half hour before convening inside the recording studio itself. Steve discussed the Seven Rules of Classical Film Music, and passed out Synopsis copies of Claudia Gorbman’s “Rules of Classical Music: Principles of Composition, Mixing and Editing” - the first time a guest has done a hand out!, and then proceeded to thoroughly cover each of the seven Principles. He then went on to show an array of scene outtakes from films as diverse as “Casablanca” and “Das Boot”, to “Vertigo” and “The Professional”, demonstrating in detail, the importance of film scores in shaping the audience’s emotional perception of each scene. Steve gave a running commentary over the various examples, and answered questions about each of the clips. His expertise and enthusiasm in Film was clearly appreciated by everyone! On Wed. July 12th we once again met at Mercy College in White Plains, for a back-to-back program with our friend Steve Ward, the only time in the group ever had the same guest twice. Steve used the software program ProTools ™ to demonstrate the principles behind “Music Editing” – showing how the manipulation of sounds, and building up a sound effects track can subtly alter the viewer’s “feel” and perception of what’s taking place on screen (a background garbage truck in BATMAN for instance). Using a sequence Steve himself shot with a Hi-8 camcorder (out the window on his train ride into White Plains on Metro North no less! ), he replayed the synched three minute piece with several different and distinct soundtracks over it, showing again, that music is not just an adjunct to a movie, but integral to our viewing experience. There were several new faces at this meet, demonstrating again, the viability of the group and the interest in it when people hear about it. We were able to take advantage of the earlier starting time to network before the program, as well as at it’s conclusion. Once again, Steve’s knowledge of Film & Music, as well as his enthusiasm were at the forefront of our get together and we again thank him for giving so graciously of his time. Some people probably doubted we’d make it, but we officially kicked off our 4th year now and the fall season, with a return to Westchester Community College in Valhalla, NY on September 27th with the program “The Meeting of Westchester’s Film HeavyWeights”. It featured two of Westchesters' most prominent Film authorities: Gannett Film writer and critic Marshall Fine, who’d previously acted in the capacity as moderator – and Vincent LoBrutto, another Westchesterite probably best known for his definitive tome “Stanley Kubrick: A Biography” (see the Announcements Section for details on both speakers). While the ostensible topic at hand was “Independent Films: Past, Present and Future”, it really served as a starting point for an informal discussion of the state of Independent Films today. For over an hour and a half in the C-100 lecture hall, the two guests, with their virtual encyclopedic knowledges of Film, engaged the nice sized turn out on a wide array of topics, exchanging views and fielding questions throughout. Again, we had many new faces, benefiting from notices in both the Gannett papers and the Westchester Section of the Sunday New York Times. After the program’s conclusion, Marshall and Vincent made themselves available to attendee’s further questions and comments. Thank you to WCC staffers Rob Ross and Peter Massarro, as well as to Gene Panczenko and Larry Karabiac for their still work. 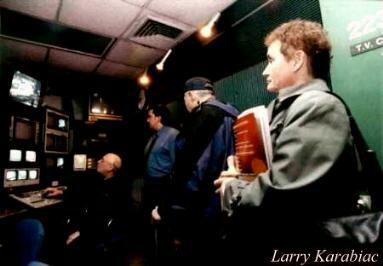 On Wednesday December 13th, we had our final meet of the 2000 at Jackie & Bob Weir’s new editing studio, The Big House (formerly Post Resources) in Ossining. The purely networking event was one of our best attended of the year, with a mix of new and old faces. As with our two previous gatherings at the Weirs, they put out a wonderful spread, and Rob gave a demonstration of the capabilities of their AVID editing system. 2000 concluded on an upbeat note for our group. In recapitulation: following a long hiatus after the program on The Business of Screenwriting with Ed Woodyard and Ethan Wiley in 1999, we got back on track with two programs with Composer Steve Ward at Mercy College in White Plains in May and July. The next program, with Westchester’s two Film heavyweights, guest speakers Vincent LoBrutto and Marshall Fine was at WCC in September. In October, Courtesy of MPE’s Neal Pilzer, we arranged to have copies of their Motion Picture and Theater Director (aka “The Yellow Book”) sent to virtually everyone on our mailing list for free in the Fall. Eugene Bellida designed something that everyone had been asking for, for three and a half years: this website that provides a link for our friends between meets, and enables anyone anywhere to read and learn about us by merely double clicking. We changed and shortened our name to the simpler, Westchester Film Group to better reflect what we’re all about. Finally, as this is being posted, we start the New Year with the first piece ever written about the group by Emily Osborne from The Westchester Arts Council in their publication artsnews. We will probably take the next few months off before scheduling our next meet, but plan to expand the content on our web page as well as the variety of programs we offer. Once again, we encourage you to submit news of interest, including your own articles. We also hope to have some major good news to report to you sometime in the Spring, but we’ll keep you apprised of various events via this website, which we’ll notify you of via email as they occur. Thanks to everyone for making this past year a successful one. Here’s wishing all of you the best for the one ahead. 2001 On Tuesday evening September 25th we held our kick-off meet of our 5th season. The site, a beautiful photography studio in Irvington, NY. over looking the Hudson, hosted some 45 people with many new faces. This meet was a low key networking get together, and like other meets with a networking theme, had no guest speakers or agenda other than for people with an interest in Film to meet one another. Eugene Bellida, Jim Evans and Jon Kaplan provided refreshments. The overhead lights were kept low, and soft music played in the background throughout, presenting a conducive atmosphere for socializing. Among the attendees were feature film director Ethan Wiley, casting director Mary Crescenzo, cinematographer Bill Winters, Ossining’s Maureen Redmond, Diane and Larry Karabiac, the latter of whom once again shot our informal stills, Diane Cricchio, the head of Irvington’s TimeLine Films, as well as Mercy College’s Dean Peter Slater. During the course of the evening we took a few minutes to address the group and talk a bit about the WFG. Announcements were also made regarding the Upstate Independents Film Group as well as the upcoming Putnam Film Festival. Our special thanks to our site host Jerry Errico as well as everyone who made this evening possible. We’re happy to report that if you missed this meet, we’re already planning our next one; a tour of the TV studio and a demonstration of Apple Computers Final Cut Pro editing software system at WCC (Westchester Community College) scheduled for November. On Wednesday November 28th at 7:30 p.m. we returned to WCC (Westchester Community College) in Valhalla, NY - room 222 of the Academic Arts Building for a demonstration of Apple's Final Cut Pro 2.0 non-linear editing software program which has been receiving rave reviews in the Film and Video community. FCP is a full featured program which puts Hollywood level editing capabilities in the hands of the lay person at an affordable cost. 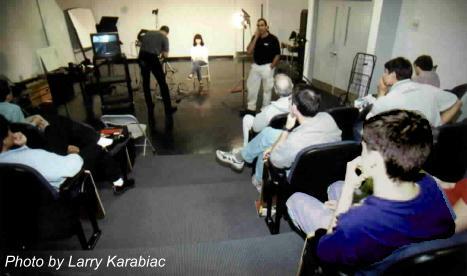 The demonstration was given by Tony Ely, a filmmaker as well as instructor at BOCES. 28 people turned out for the meet. Considering that this was a very niche topic with seemingly limited appeal (Final Cut Pro at this point only runs on an Apple), it was a more than respectable turn out with a few new faces. It was also the second time that we were able to provide some freebies; a coupon good for a film book as well as an FCP demo cd, the former courtesy of Focal Press and the latter courtesy of Magneticmedia. At the conclusion, Prof. Bill Winters gave a short tour of WCC's television studio where all the campus on air programming is created. Our thanks once again to Tony, Lorenzo Battle, president of the WCC Video Club, and Prof. Winters who sponsored our group under the auspices of the WCC Video Club. On Wednesday December 19th at 7:00 p.m. we returned to Irvington to the private studio where we’d held our September meet to close out the year with an open networking party. This time we made a special point of asking people to rsvp and to bring a food dish if they could. The response was overwhelming. It was gratifying to see people pitching in so enthusiastically. With plenty of refreshments as well as many new faces and music playing in the background, we had what was surely the largest turnout in several years, with some 55-60 people showing up throughout the course of the evening. Jim Evans who’s played an increasingly larger role in the group, again provided dozens of free Video magazines and this time handed out a free Christmas Film book present on either Cinematography, Directing or Screenwriting courtesy of Focal Press to attendees as they left. So, while we had an abbreviated event schedule this past calendar year owing to earlier unforeseen cancellations, we certainly ended 2001 on an up note. We’ll now go on hiatus for the winter months, finishing those screenplays, shorts and various other projects that we’d put off for far too long, and start up again in the spring. Once again, everyone who’s on our emailing list will receive announcements regarding upcoming events automatically as soon as the programs are locked into place. Here’s wishing all of you a Happy and Healthy 2002!!! Note: To get on our emailing list and be notified of upcoming events/meets or to contact us, simply click on the "Contact Us" button on the Home Page. WFG Kicks Off 6th Year at Mercy College!!! Lowel Lighting Workshop Featured: At 8pm on Tuesday September 24th we kicked off the beginning of our 6th year by returning to Mercy College's White Plains' Center for Digital Arts (www.mercy.edu). There in Mercy's new theater, Jim Evans, list administrator for the Hudson Valley list of Webcinema.org and the one responsible for setting up this program, as well our last one, introduced Eric Druker, a representative for Lowel Lights (www.lowel.com). Lowel is one of the nation's oldest, largest and best known manufacturers of motion picture and television lighting fixtures. Eric gave a lighting workshop, a first for our group. Using a camcorder and live monitor and with Lena Eorio, who previously helped us set up in July, graciously volunteering as the model, Eric demonstrated an array of lighting fixtures and grip equipment, including Tungstens and Fluorescents, and showed how a minimum amount of equipment could be utilized for maximum performance. Beforehand, starting at 7pm, we once again had an informal networking session which ran almost an hour, setting up one table of refreshments and another for various periodicals and flyers, including Focal Press catalogs. The program portion went almost a full two hours before we wrapped things up around 10pm. The meet was significant for a number of reasons. Besides the addition of several new faces, it showed that even though our events are held on an irregular basis, usually based around the availability of a guest speaker, that there continues to be interest in Film and Video here in the 'burbs. Additionally, while it doesn't seem possible, it also marked the beginning of our 6th year as a group! For those who have not gone through the entire chronological history of the WFG, it should be noted here, that it was, ironically, at this very spot, some five years ago, that the group, held all of it's earliest meets, in a small side room at what was then a bar called The Fireworks Brewery. So for those of us who were here at the beginning, it's been quite a journey, at least symbolically, if not literally. While we have no meets scheduled at this time for October, there will be an announcement sent out regarding a related non-WFG event of possible interest, in November. That will go out late October/early November. We have already made queries regarding upcoming events and as soon as they are confirmed, you will of course, be automatically contacted at least two weeks ahead of time if you're on our email list. Once again we extend our most sincere thanks to Mercy's Dean Peter Slater and Digital Program Director Jeff Bellantoni, for letting us Mercy for this event. A special thanks to Erick Druker of Lowel for his great presentation, and to Lena Eorio for being his patient model. Also, thanks to Joe Eboli from the Music Technology Department for use of the monitor. Thanks also to photographer Larry Karabiac, who continues to document the history of this group through his Canon 35mm over these past five years. Last but not least, thanks to everyone who showed up. We hope to see you all at our next meet. On Wednesday November 13th at 7 pm, Jonathan Kaplan, head of The Westchester Film Group, and the 2002 winner for "Best Screenplay" at the Westchester Film Festival, gave a screenwriting workshop at the White Plains Public Library. Though sponsored by the WPPL and not an official WFG group meet per se, several WFG members were, nonetheless, in attendance. 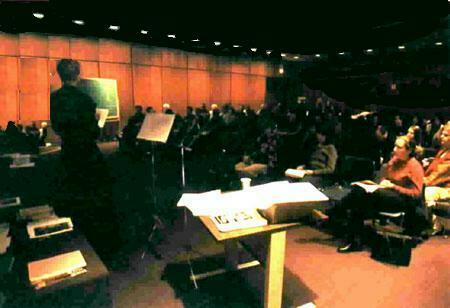 The program, the first of it's kind at the library, attracted some 65 people. In just under two hours, using movie clips, Jonathan covered some of the basic concepts, such as Three Act Structure, formatting requirements, and character development that go into script construction. At the workshop's conclusion, a three page list of Writing Resources and copies of Screenwriter magazine, generously donated by The NY Screenwriter, were handed to attendees. Jonathan is slated to teach a six week course 'Screenwriting: The Basics and Beyond" for Westchester County's Dept. of Continuing Education in February at WCC. 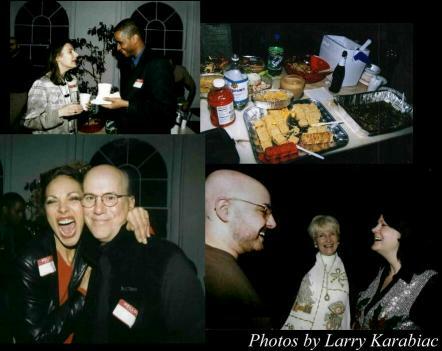 On Wednesday December 11th, we held our final meet of 2002, an informal by- invitation rsvp party at Rob and Jackie Weir's editing studio, The Big House, in Ossining, NY. Though several were unable to attend due to the increasingly inclement weather, rather than risk a possible similar situation weather-wise a week later,we decided not to cancel it. Additionally, because so many people had already made extensive food preparations and schedule arrangements in their calendars, we felt it was best to go ahead. It turned out to be the right call. With just over some two dozen people, about half being new faces, there was plenty of socializing and we still ended up with an over abundance of food. Mark Sadan screened a short documentary shot by Frank Cantor and edited by Rob Weir and Larry Miller. Once again we extend our sincerest thanks to the Weirs who were kind enough to extend the party an hour past it's scheduled closing time. Those who braved the elements were rewarded not only by an entertaining evening of good company, but by copies of The New York Production Guide, a massive $50 Film and Video directory, arranged for by Program Director Jim Evans, which we handed out as presents to all the attendees. Also a special thanks to Lena Eorio who has once again gone out of her way to help with the food preparations for the last several meets. 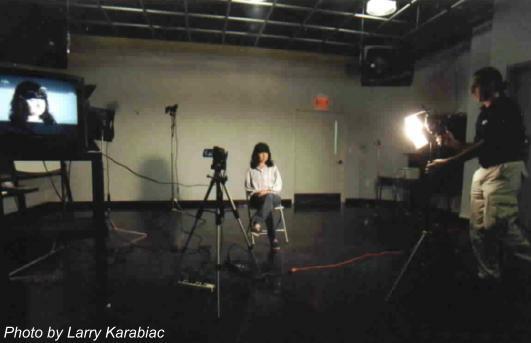 In many ways this was one of our most successful years, the high point being our record breaking turnout for the Sony/CineAlta Vista 24p Digital Camera demonstration in July at Mercy college, preceded by extensive media coverage and a long awaited favorable write-up in the NY Times. All the while our data base of contacts has steadily grown and the WFG has increasingly become the networking and educational 'hub' organization to go to whenever someone has any sort of question regarding Film or Video in Westchester County. As in previous years, we'll now go on our winter break, in order to give everyone involved with programming these events, time to rest up and attend to their various Film and writing projects which often get put on the back burner because of the time and energy involved in setting up these meets. We've already made arrangements for our next program, which to avoid conflicting with the Westchester County Film Festival in March, we'll announce, probably sometime in April. Once again, thanks to all of you who helped support us with your attendance in this past year. We are and have always been about mutual support; helping and sharing with one another, and in the process, serving the Film/Video community in Westchester County. Our best wishes to all of you for a happy and healthy 2003! Jonathan, last year's award winner for "Best Screenplay", will be teaching a new screenwriting course at WCC starting Feb. 13th. On Tuesday April 22nd, we met at Mercy College in White Plains for a combination networking/program meet. Without benefit of any notices in the local media this time, and notification solely from our growing email list and flyers, we had a nice turnout of approximately forty attendees. After refreshments and networking for an hour we began the Shorts film program; The five semi-finalists from Hypnotic.com's nation wide $1,000,000 "Best of" shorts search were screened. This was the first time in several years, (excepting last July's "Dreams" compilation which was part of SONY's Cine Alta "Star Wars" camera demo), that a WFG program portion of a meet was centered around a screening. The five narrative shorts varied widely in length and subject matter, with one, "The Parlor" as a stand-out and crowd favorite for it's originality and "Gotcha!" ending. Ironically, it was also one of shortest and the simplest selections. Taking place for the most part, in a single room with only a handful of characters and minus any special efx, props or visuals, it was an accomplished demonstration of low budget filmmaking at it's best when a clever concept is fully realized. We'd like to extend our grateful appreciation to Dean Susan Riehm for allowing us to stage our program at Mercy, as well as Digital Program Dir. Jeff Bellantoni and Nazih Aziz, CART facilities manager, for their help. Welcome and thank you Anne Reid for all your help and for greeting newcomers in assisting them with the sign-in sheets!! Many Thanks: Rob Bruzio and Ritchie B. of BeeHarris Productions. Bill Winters for your technical assistance. Program Director Jim Evans & Genai Corban for helping set this all up. Eugene Bellida for web site postings. If you're on our email list you'll automatically receive advance notice of all future meets. While no firm date for our next meet has been set yet, we are already exploring several options. Please continue to check our website as we often post messages from filmmakers offering and looking for film 'gigs' as well as other news under "Announcements" in our "cork board" section. We also make new additions to "Movies Shot in Westchester" as we learn about them. Kodak at Mercy WP - WFG STARTS ITS 7th YEAR! One example of how any given meet can reap unexpected benefits for those willing to make the trek and press the flesh, was the results of our Februrary 1999 get together. Westchesterites writers Eugene John Bellida and Michael D. Stabile had attended this first get together after attending the Terry George program in November. There, Eugene ran into high school acquaintance Fabrizio Fante of Mamaroneck, who’d in recent years become interested in filmmaking. They also met Ossining Cinematographer Joe DiGenarro and Yonkers resident, producer Steve Worthy Knight, who was checking out his first gathering. Eugene and Mike were looking to shoot a feature, but had written a short, which was shown to Steve. To encapsulate, the group ended up holding a casting session in August in White Plains, and by the Fall, Eugene and Mike’s Empty Places was produced by Steve, photographed by Joe, and utilizing cast and crew drawn from the then ‘914’ group (now, the WFG), completed. Additionally, a second short Jake, was also produced by Steve, Eugene & Mike and written and directed by Joe, again using many group members. Lastly, while we are of course, always pursuing guest speakers, the intention was never to simply schedule a speaker for the sake of having one. We like to know that there is first, an interest from the Westchester film community, and, then, we must always work around the schedules of our guests, to best accomodate them. Sometimes though, what appears as a strong initial interest is only fleeting. Please continue with your suggestions! You filmmakers and film afficionados. You are the lifeblood of the WFG. If you’ll notice, despite using the term "members" in our flyers or discussions, we never had any formalized, dues paying membership per se. After discussing the subject with counsel at the time, we felt that there wasn’t any advantage pursuing a not-for-profit 501 status. Additionally, we decided against narrowing the focus of the group to a single sub-division of filmmaking, such as only the aesthetic aspects, or only the technical aspects - in favor of a more wide open, eclectic approach. Ultimately of course, while we always tried to keep meticulous count on our attendences, perhaps that was never the absolute and true measure of ‘success’ of any given meet. If the attendees learned something new, made a new contact that they wouldn’t have made without the benefit of the group, or simply had an enjoyable evening, then by all rights, that meet was a success. In the meanwhile, if YOU know of someone whom you think would make a great guest, chances are others may feel the same. E-mail your suggestions, we promise to respond asap. One always runs the error of omissions when creating any kind of a "thank you" list. Not so much in "where do you begin"? - but rather, "where do you end"? 1. ALL the guest speakers who so unselfishly gave of their time and energy without any renumeration whatsoever. 2. ALL THE ATTENDEES; you who came out in all kinds of weather, often from one end of the county to the other to our events, large and small, for your support. You are the sole reason for having this club, this organization, whichever you prefer to call it.